We have three main types of wood shutters here at Cool Shutters all made to measure to fit your windows with detail and precision. Whatever style of shutter you are looking for, and regardless of the size, or whether your windows are an unusual shape, we can custom make a stylish shutter in your choice of wood. Choose the beauty of Basswood Shutters, the elegance of Elm Wood Shutters, or pick something from our Poplar Shutter collection and have them made to measure for your home. Basswood shutters are a tasteful treatment for window shutters being economical yet extremely durable. With a tight grain, they look beautiful when painted in your choice of finish, and look especially wonderful in a bright, white finish. Elm Wood shutters for windows have a graceful, elegant appearance and we can hand-make them made to measure for windows and doors. Offering a slightly deeper grain than Basswood, Elm wooden window shutters provide a natural wood effect which can be enhanced with the introduction of a tasteful stain. Poplar wooden shutters offer a smooth and natural grain which can also be painted in a choice of natural colours to add style and character to doors and windows. Ideal for larger windows, Poplar wood shutters look especially pleasing in darker colours, such as walnut, cherry or black window shutters. Whatever style of plantation shutter you are looking for, we are sure to have just the right type of wood for you here at Cool Shutters with the perfect shutter solution from the Ambiente collection. Where better to look for wooden shutters than Cool Shutters, the home of the Ambiente shutter collection. Adding to the value and the architectural character of any type of property, Ambiente wooden window shutters are stylish, distinctive and highly reminiscent of Mediterranean architecture, so sure to be a genuine asset to your home. With their flawless looks and unquestionable taste, interior wooden window shutters are made in a variety of styles with sizes to suit all areas of your home. Tasteful, dependable and always in high demand; solid hardwood shutters have so many benefits, and the Ambiente collection from Cool Shutters is made to traditional customs and values, with bespoke plantation shutters available and made to measure for any window. Here at Cool Shutters, we supply and fit the Ambiente Collection of wooden shutters to homeowners who expect the very best from their window treatments. Each individual shutter is hand-made from the finest hardwood materials and tailored to fit the windows at your property, making this a lifetime investment whilst creating a stylish atmosphere. All of our made to measure wooden shutters look amazing from the inside and out, adding value, style and sophistication to your home. Why Purchase Ambiente Wooden Shutters For Windows? 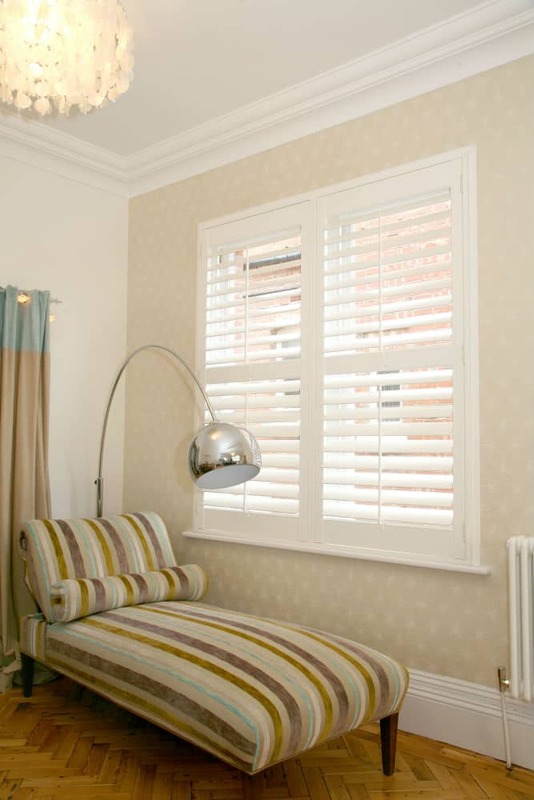 Classic interior wooden shutters offer so much more than just stylish window dressings. They help to insulate your property, enable you to regulate light and have everlasting appeal, with non-standard sizes readily available so you can easily find the ideal shutter for any room. Made to superior standards, wooden window shutters connect with the architecture inside your property to improve the interior design and give you instant control over light and shade. Custom made just for you, simply select the finish and we will be happy to manufacture and install your new wood shutters and can even match the colour to go with your interior decor. Send us a few details about your personal requirements and we can provide you with a FREE quote for wooden shutters to suit any room. You can use our FREE Quote Form and we’ll be in touch with a true and accurate estimate, or you can contact us if you prefer by calling us on 0800 470 2180.